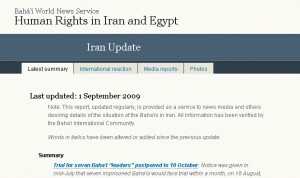 Die Internationale Bahá’í-Gemeinde hat heute ein update über die Lage der Bahá’í in Iran veröffentlicht. Demnach befinden sich derzeit 33 Bahá’í in iranischen Gefängnissen, darüber hinaus sind rund 200 Gerichtsverfahren anhängig. Counting the seven people in Tehran who formerly constituted the Friends in Iran, at least 33 Iranian Baha’is are in prison because of their religion. The number of Baha’is in detention varies frequently because new people are arrested but others released after posting cash, property deeds, or business licenses as collateral. Since the beginning of 2009, Baha’is have been arrested or detained in Tehran, Ghaemshahr, Mashhad, Sari, Yazd, Shiraz, Semnan, Hamadan, Babol, Karaj, Tonekabon, Miandoah, Mahforouzak, and Kashan. The collateral required for temporary release from custody is often exorbitant. A woman in Semnan who was arrested this summer and released two weeks later was required to post bail in the amount of 100 million tumans – approximately $100,000. The court cases of more than 200 Baha’is are still active. These include individuals in prison, those who have been released pending trial, those who have appealed their verdicts, those awaiting notification to begin serving prison sentences, and a few who are serving periods of internal exile. Thousands more have been questioned, threatened, or deprived of pensions, livelihood or education.